That's what the rest of the world has been doing in recent months, in massive quantities. And it makes perfect sense. After all, it's hard to think of any asset that is more safe and more liquid than dollar deposits kept in a bank account with the Fed, i.e. "reserves". And right now, banks -- especially European banks -- are clearly desperate for additional safe, liquid dollar assets. So that's why this time around, unlike during the banking crisis of late 2008, when the deposits of US banks with the Fed increased dramatically, it's now primarily non-US banks that have been pouring the most money into their accounts with the Fed. The following graph and table tell the story. Foreign-related banks in the US have doubled their deposits with the Fed in 2011, while US banks have increased their reserve holdings relatively little compared to 2008. I've made this point in a couple of different ways over the past two weeks, but this data makes it more explicit. And the story it tells is a relatively simple one: banks around the world -- and specifically financial institutions in Europe, it seems -- have taken hundreds of billions of dollars out of Europe and moved them to the world's safest bank. So what's so attractive to non-US banks about keeping cash with the Fed right now? There are a couple of possible reasons, which are familiar to us from late 2008 when banks desperately sought to obtain reserve assets in the wake of Lehman's collapse. 1. Liquidity hoarding: if you're worried that you may need some dollars and won't be able to borrow them at a reasonable price from another bank -- perhaps because you think you might be deemed to be a credit risk -- then it makes sense to have your own stockpile of liquid dollar resources. 2. Counterparty risk: if you're worried that any dollars that you lend to another bank won't get repaid -- which might happen if the borrower goes under while they still have the dollars you loaned to them -- then you will be reluctant to lend out your dollars, and instead will just keep them yourself. Note that there's no reason that both effects can't be present at the same time. There's some evidence that during the 2008 banking crisis the hoarding of Fed reserves by financial institutions was primarily due to counterparty risk, not liquidity concerns. (See for example the NY Fed staff paper "Stressed, Not Frozen: The Federal Funds Market in the Financial Crisis" by Afonso, Kovner, and Schoar (pdf).) But with respect to European banks today, I have the sense (admittedly unsupported by any concrete data) that liquidity concerns are paramount. What are the implications of this phenomenon? I can think of a couple. 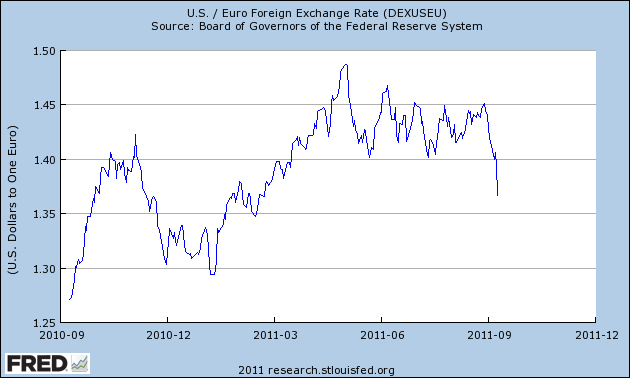 First, one might think that this would have contributed toward a strengthening of the dollar in 2011. But keep in mind that much of the cash being transferred to the US may have been in dollar form to begin with (i.e. 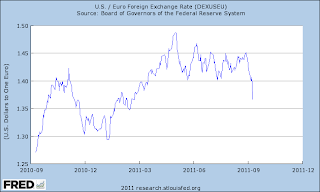 eurodollar assets), in which case the impact on the exchange rate would be limited, which may explain why the dollar has remained roughly unchanged against the euro (within +/- 5% of 1.40 USD/euro) over the past year (see chart). In addition, other forces affect the exchange rate as well, such as the weak and slowing US recovery, which has probably tended to push the dollar down. Second, this suggests that the dfficulties that some European banks may be having in obtaining dollars are not simply due to the retreat of US money market funds from Europe -- the actions of European banks themselves are also contributing to the shortage of dollars in Europe. This raises the likelihood that, so long as fear and uncertainty reign in Europe's financial markets, we'll probably hear more about the dollar shortage on the eastern shores of the Atlantic. Finally, it's worth considering what a continuation of this phenomenon could mean for the US. Over the past 8 months we've been in the unusual situation where the increased demand for dollar reserves by non-US banks has coincided with an increase in the overall quantity of reserves in the US banking system, thanks to QE2. That has made it relatively easy for European banks to increase their dollar reserves. But the quantity of bank reserves (i.e. deposits) with the Fed is now essentially fixed, and unless QE3 is permitted, will not be allowed to grow again any time soon. Given that, if European banks continue to try to acquire additional dollar reserves, then it's conceivable that the stresses showing up in the market for dollars in Europe could cross the Atlantic. Because if European banks continue to seek a safe haven in the US for their cash, they are now going to have to start persuading domestic US banks to part with some of their own limited dollar reserves, driving their price up. There have been no signs of such spillovers yet (as far as I am aware), but it is something that bears watching. Because due to the peculiar nature of bank reserves, even if everyone wants to keep their cash in the world's safest bank, not everyone can. Kash, have there been offsetting changes to the frgn banks' balance sheet that show the funding source of their reserve buildup? - Liquidating other assets or a boost in liabilities? Some have speculated that the Frgn banks were the main "beneficiary" of QE2 as their reserves rose about $600B during the time QE2 was in operation vs nothing for domestic banks. And now with the Euro problems the Fed is looking into these balances. Probably wouldn't look good if the were to transfer cash to their parents. You have ignored the fact that world's safest banks are China's banks, which is backed by 3 trillion USD. to watch out for brussels. I'll appreciate if you continue this in future. Lots of people will be benefited from your writing. Cheers! using for this site? I'm getting fed up of Wordpress because I've had issues with hackers and I'm looking at options for another platform. I would be awesome if you could point me in the direction of a good platform.